Where did the weekend go?! I swear it was just Friday, but don’t I say that every Monday?! 😉 I feel like someone’s gotta kick Mondays in the arse. Thank you, Julie! This totally made my day. I love the fall for its colors. Beautiful, isn't it?! I know a lot of people have asked to see the scraproom. Well, to be honest, I haven’t posted pictures of it because it was going through a messy stage! …but then again, when is it not in a messy stage?! haha. LOL. Once I start creating, I make a mess here, and then it’s there. By the time I finish, it’s in the dining room. Yikes! Can you believe I managed to make a mess in the dining room too?! As for the furbabies, Maui and Hilo are doing wonderfully. Maui is the usual — gentle, sweet, and always on the lookout for squirrels and birds. Her favorite hobby: on the lookout for squirrels. Hilo, the monster, is growing way too fast. He just got his haircut, so he’s totally embarrassed about it right now because all of his spots can be seen. He is SOOOOOO crazy, but oh so cute! Now, I’m off to continue watching Say Yes to the Dress. 😉 It’s making me want to go look around for dresses. hahaha. Aww, a pup with a new do! 🙂 Cute and how cute are those embellies Julie sent you. I still got to get your box out to ya. Hopefully I can get it to you this weekend. I’ll letca know. sarah your amazing, Please send me some of your creative talent as I’m so lacking these days. we need to have a puppy playdate. know any good dog parks on your side of the hill? Wow..a beautiful LO as always Sarah! LOve your fall decoration…beautiful! !Love the fall colors! i can’t find you on FB… add me! I love the mess.. its creativity at its best! 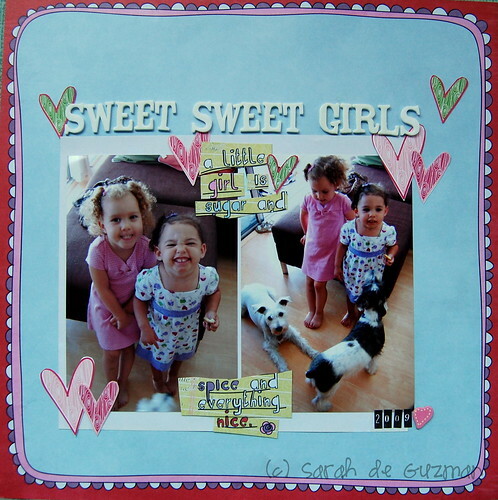 Love those embellishments, your 2 furbabies, and the layout. Have a great week! Love the fall wreath and that sweet LO! The wreath is beautiful and your fur babies are too cute! my house is always a wreck because of my scrap stuff too, we alll know how it is! lol! And awesome layout, sweets! Hope you are having a great week! I enjjoy what you guys are usually up too. This ort of clever work and coverage!